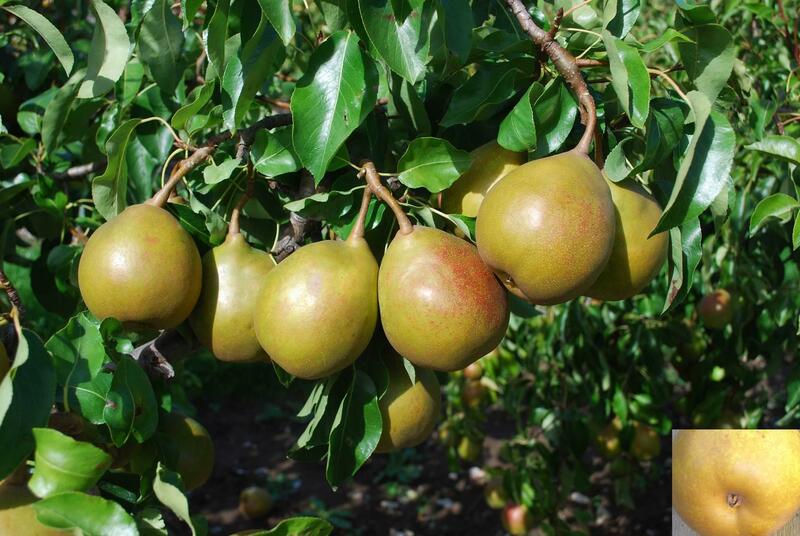 Author Joan Morgan says Beurré Superfin is one of her favorite pears. It's "truly delicious: very buttery, juicy, cream to pale yellow flesh, intensely rich with plenty of sugar lemony acidity," she writes in The Book of Pears. An illustration of a French property with pear and other fruit trees trained against the walls. The Doyenne du Comice pear is a "pear of superlatives; grown all over the world in gardens and for market. Handsome, generous appearance with rich, luscious, very buttery, exquisitely textured, pale cream flesh," writes Morgan. But flip through The Book of Pears, The Definitive History And Guide To Over 500 Varieties, and it may dawn on you that we actually missed one of the great eras in fruit history. 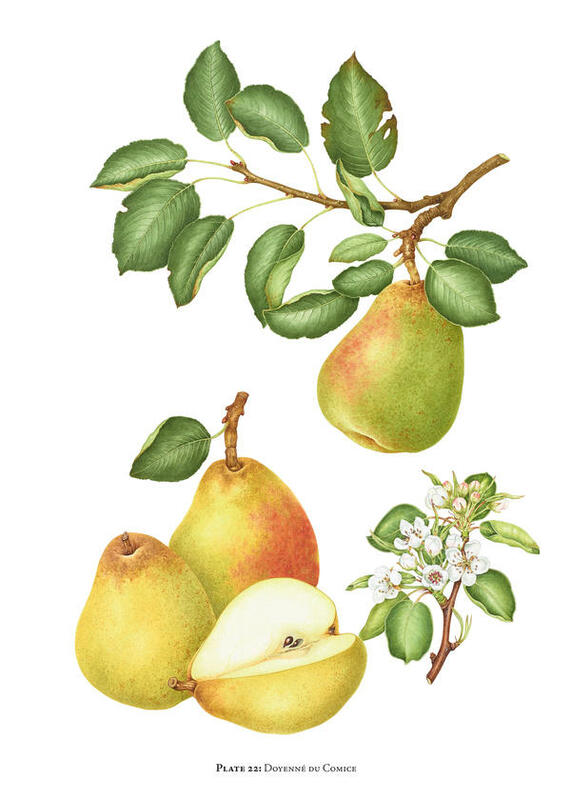 As this gorgeously illustrated compendium on the pear reveals, various generations of Europeans feasted on a wider and better selection of pears than we do today. Of course, Harry & David, the Oregon company that invented mail order pears in the 1930s, helped bring the superlative pear experience to Americans. One of my great aunts used to send us a box of the rosy, juicy and buttery Royal Riviera pears — known in Europe as Comice pears — from Harry & David nearly every Christmas. The tissue wrapping around each fat fruit signaled to me just how special and luxurious they were. But "peak pear" occurred in Europe over a century ago, according to Joan Morgan, who published The Book of Pears this October, after researching the fruit for some 10 years. Since then, pear growers' attention has increasingly turned to commercial production, bringing about more uniformity and less consumer appreciation for the pears planted around the world. Morgan, a pomologist and fruit historian who also wrote 1993's The Book of Apples with Alison Richards (who, full disclosure, is an editor at NPR), says we're beginning to seriously reconsider the pear. We're rediscovering not just the rich diversity of varieties that exist, but also the value of pear orchards to our landscapes. And for those eager to dive in deep, there's a companion website with a gallery of photographs of almost every one of the 500 or so pears described in the book. We reached Morgan at her home in Kent, England, to chat about her exhaustive exploration of the pear, which took her to fruit research centers in Iran and Syria, among other places. Here's part of our conversation, edited for brevity and clarity. When was peak pear culture? 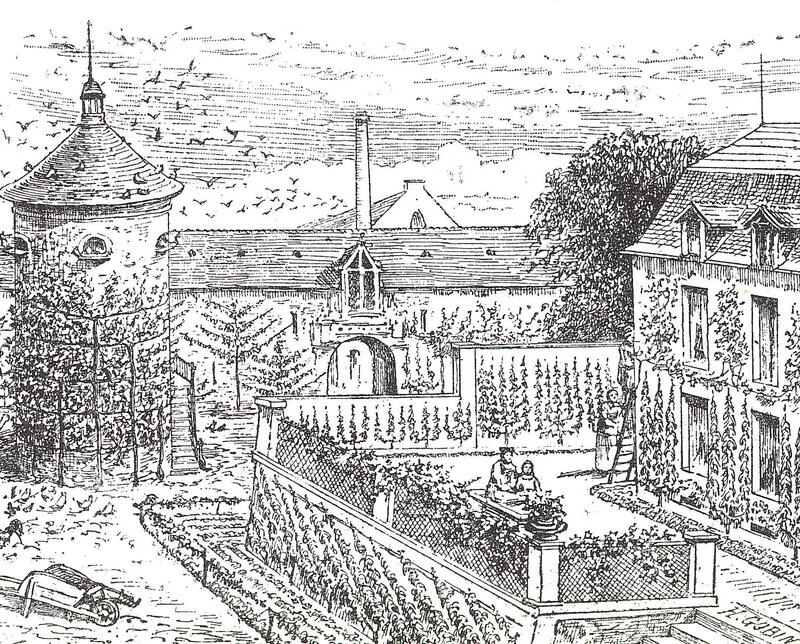 France was a place where the pear was appreciated above the apple in the 17th century and 18th century and, indeed, until comparatively recent times. I suppose the next era of feverish pear breeding activity was in Flanders, in the area that became Belgium, in the 18th and 19th centuries. There were an extraordinary number of people raising pears, and records say that there were about 1,000 named varieties. And the pear certainly reached its zenith in Victorian England, where head gardeners might be growing 50 to 100 different varieties of pears, so that you would have these successions of gorgeous, buttery, melting flesh pears, with all sorts of exotic perfumes. It was a wonderful, wonderful celebration of fruit, and in particular the pear. Can you explain that idea of a succession of pears? If you look at the peak in Victorian England, you needed a succession of fruit to serve at meals through the year. So you are needing a range of different pears in August, a different selection for September, different ones again October, and so on, with exquisite ones for Christmas ... right through almost to springtime. So the objective of the private garden in England has always been to have lots of different varieties to give this succession of interest, but also to give the different seasons. And pears were considered a most special dessert, weren't they? For centuries, dessert referred to the absolute finale, which could be a selection of fresh fruit and all sorts of sweet delicacies, like crystallized fruits, sugared nuts and jellies. When we get to Victorian England in the grandest situations where they had enormous fruit collections and dozens of gardeners fussing over them, this finale (after the puddings) would be entirely fresh fruit: grapes, peaches, pears, strawberries, whatever the season was. Perhaps today we should do away with puddings and have fresh fruit instead; that's the moment to treasure these perfectly ripe specimens. You describe three qualities that set the pear apart from the apple and other tree fruits — qualities that make it, as you write, "the most exciting of the tree fruits." Can you talk a little bit about its "luscious textures, boudoir perfumes and richness of taste"? Summer pears you can eat fresh from the tree. But all other varieties, across the seasons, you pick them from the tree and store them in a cool, dark place to mature and develop these wonderful textures and exotic flavors. And you get these very fine, luscious textures in the very best varieties. And also in the very best varieties, you get these exotic scents: perfumes like rosewater, musk and vanilla. They are aromatic compounds, synthesized in the pear during [storage], and then when you bite in, they are released into the mouth. As you bite into the finest pears, the reason why you have Buerre as part of name of many varieties of pears is because they liken the texture of the flesh to butter. When you just bite into it, there's a little bit of resistance, and then it melts in your mouth like butter. So how, then, was the pear slowly and subtlety eclipsed by the apple and other tree fruit? One of the problems with the pear is that hitting it right, getting it at this point of perfection, is quite difficult. Pears will be sold unripe, and you need to ripen them at home. That has always presented in the marketplace a challenge for the people selling the fruit and the people buying it. You have to to have knowledge, you have to have patience and treat the pear properly, and ripen it up at home. It's also that generally, I suppose, apples are easier to grow for gardeners and commercial producers. And all the research development in recent years has focused much more on apples than pears. Also, pears are not quite so easy to handle — they can bruise easily. And since generally apples have a rounded shape, they are easier to pack. Pears have a pyriform shape, more elongated, and are generally a bit more challenging. How do you know when a pear is perfectly ripe? When you press it very gently around the stalk end, it will yield a little bit and that will indicate that it's right. You musn't handle them too much or they will bruise and go over, and you musn't forget them, of course. If you forget them, they will certainly go over and they will be a great disappointment. In your final chapter, you mention that there is more interest today in planting more varieties. Do you think there is a true revival of pear culture happening? There's been a great revival in interest in apples — huge interest in traditional varieties and regional varieties. We now [in England] have things like Apple Day, apple festivals, all these regional fruit societies, regional groups building up orchards. I think it's time we also embraced the pear in this revival. Pear trees can live longer than apples trees. They can be magnificent specimens, and contribute to the landscape of an area, as they traditionally do in the parts of England where they're grown to turn into perry [a beverage, similar to cider, made with pears]. As with apples, we also need to recover the local traditions associated with pear — the particular varieties that might have been planted in areas. Above all, we want to recover this ancient tradition of celebrating fruit — celebrating it for its wonderful, glorious colors, its wonderful tastes, perfumes, textures and so on. [We] really can make fruit a much more prominent thing, rather than something that nowadays we seem to just crunch and forget. This can be a memorable occasion: eating a truly perfect, ripe, luscious pear. And if you could eat any pear right now, which variety would you choose? This is difficult to say. I like Doyenné du Comice very much indeed. Also, Fondante d'Automne (called Belle Lucrative in U.S.) is wonderful. But perhaps even better is Beurré Superfin. Then there is also Joséphine de Malines, which is a later season pear. But I do really like Beurré Superfin. Check out a holiday fruit basket, and chances are, it contains a Comice pear. The Comice is just one of many varieties of pear, and Eliza Barclay of NPR's food blog, The Salt, has this story about one of that fruit's greatest fans. ELIZA BARCLAY, BYLINE: Joan Morgan is a British fruit expert and historian. She spent 10 years researching and tasting pears from all over the world. She says the Comice is considered to be the finest of all the pears. JOAN MORGAN: You get these wonderful, very fine, luscious textures, exotic scents. BARCLAY: She just published "The Book Of Pears." In it, she describes the days when the pear was the preeminent fruit on the table. MORGAN: France would be one where certainly the pear was appreciated, and appreciated above the apple. In the 17th century and the 18th century, they celebrated the pear. BARCLAY: Morgan says the pear's heyday was in Victorian England, where head gardeners grew 50 to a hundred different varieties at a time. Everyone back then wanted to eat pears from fall through the spring. MORGAN: Pears were a feature of the dining tables of the affluent and the more modest homes, served as a grand finale of fresh fruit to a dinner party. BARCLAY: America got pear fever, too. MORGAN: California turned out to be pear heaven. This was where pears grew more beautifully and larger than ever before. BARCLAY: But in the 20th century as pears became an agricultural commodity, growers began focusing on the most productive varieties. Those are the ones we know today, the Comice but also the Bartlett, Bosc and D'anjou. Morgan says these remain some of the very best pears to eat and cook with, but she says we're missing out on hundreds of other fabulous varieties, which is why she's on a mission to help us start growing them again. MORGAN: We want to recover this ancient tradition of celebrating fruit, you know, celebrating it for its wonderful, glorious colors, its wonderful tastes, textures and so on. BARCLAY: Why not start with a holiday pear? Eliza Barclay, NPR News. Transcript provided by NPR, Copyright NPR.